Simplicity, sustainability and ecology are the leitmotivs of Vorarlberg, a small region in Austria the size of Luxembourg (2600 km2). After the collapse of the textile industry, the region successfully relied on wood, becoming in a few years a real model for the enthusiasts of wooden constructions who come to draw their inspiration from it. A group of 12 members of the Wood Cluster visited the site. 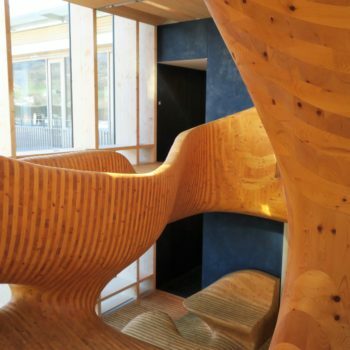 Aware of the potential of the Vorarlberg region and the opportunity that the timber industry could offer, a group of architects succeeded in combining sustainable and energy-efficient buildings with contemporary architecture. This transformation of the landscape, which has taken place in just three decades, is based on a series of innovative projects that have made the region famous today, to the point of becoming a world reference in terms of ecology and sustainable development. Invited by Advantage Austria Brussels in cooperation with the Vorarlberg Chamber of Commerce and VAI (Vorarlberg Institute of Architecture), a delegation of 12 Belgian and 12 Luxembourg participants composed of architects, engineers, builders, industrialists and specifiers / investors had the opportunity to discover during two days the facets of Austrian know-how in the field of wooden constructions. “One of the main missions of the Cluster is to ‘connect’ the actors with each other. We do this in Luxembourg, but also with our partners in Europe. 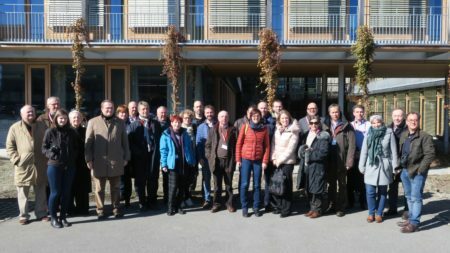 We are delighted to have been able to meet our Austrian counterparts and exchange views with them,” explains Philippe Genot, manager of the Luxembourg Wood Cluster. Designed by architect Hermann Kaufmann, this 8-storey office building is the region’s flagship project. The 27-metre high hybrid structure is made of wood and concrete. 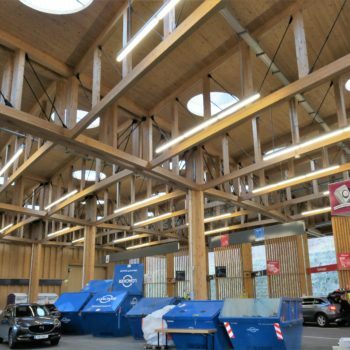 The covering structure of this recycling centre is made entirely of wood. 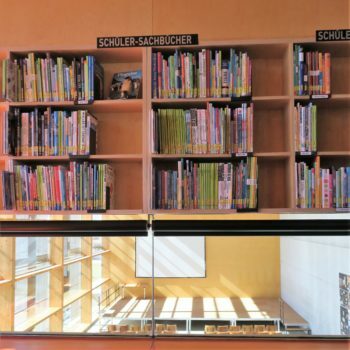 This school, entirely made of wood, is the first educational building in Austria to meet the passive standard. The students of this eco-responsible college enjoy the privilege of living ecology on a daily basis and are regularly involved in environmental projects. The architecture of this nursery school is reminiscent of a four-leaf clover. Built entirely of regional wood, this kindergarten has been designed to be as modern as it is functional. 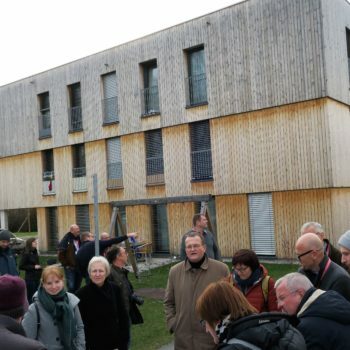 These social housing units have required the involvement of the entire value chain of the regional timber sector, a good example of the value of know-how. With its modular composition, this residential complex fits perfectly into the surrounding urban planning. A day was also devoted to visiting two local companies. 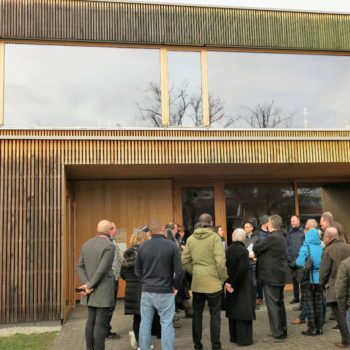 Under the guidance of CEO Hermann Böhler, the delegation was able to appreciate the ultramodern facilities of i + R HOLZBAU & FENSTERBAU, a company located in Lauterach specialising in the construction of housing, commercial buildings and wooden windows. The second stop was Wolfurt, at the company BERCHTOLD HOLZBAU GMBH & CO KG. Thomas Kruijen presented the various projects for dry construction, interior design, stairs and wooden structures. “The Vorarlberg region is quite similar to Luxembourg in terms of the evolution of the real estate market, land prices… It is a real open-air laboratory for timber construction. This gives an even broader overview to prescribers and value chain actors of what can be achieved,” confirms Philippe Genot. 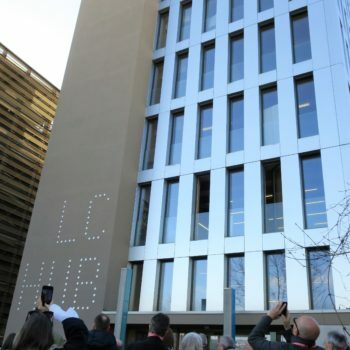 Several buildings built in Europe in recent years have been directly inspired by the example of Vorarlberg where, as in Luxembourg, the wood sector focuses on the enhancement of existing buildings through renovation, but also prefabrication. Promoting the local wood resource and local know-how is also at the heart of the concerns. The ecological and economic potential of wood construction is no longer to be proven. Today, wood perfectly meets the challenges of building innovative buildings with high energy efficiency. “Modularity and prefabrication are two essential development paths in wood construction. With Luxinnovation and within the cluster, we support our member companies in this innovation process. I am convinced that visits like this, with the creation of links with pioneering companies in Vorarlberg and the transfer of knowledge between our two countries, are good ways to achieve this,” says Philippe Genot. In Luxembourg, the wood sector has some 1,200 companies, about 25% of which are directly linked to wood construction and 7% to architecture and wood engineering. Wood: following promotion, comes action! 2018 was a fruitful year for the Luxembourg Wood Cluster. One of its reached main goals was to link the companies and other players in the wood value chain in Luxembourg and in the Greater Region and to promote the use of wood.